Easily found on SH1 just south of Timaru, the wagon load of huge strawberries at the entrance is a pretty clear message you’ve arrived at the iconic Butlers Fruit Farm & café. Renowned for their high quality fruit and produce, awesome coffee, delectable selection of food, combined with friendly service and backpacker accommodation, Butlers Fruit Farm on SH1 just south of Timaru is a destination for all. The wagon load of huge strawberries at the entrance is a pretty clear message you’ve arrived at the ionic Butlers Fruit Farm & café. Shop & café: Jackie and Donald Butler invite you to drop in and stay awhile, the licensed café serves mouth watering berry-inspired food, fresh fruit ice-cream sundaes and smoothies to die for. You can smell, taste and buy the jams and chutneys made on site. A perfect venue: Family groups, smaller event and wedding parties are welcomed, seating up to 50 people in the café and marquee space in the grounds surrounded by strawberry fields. 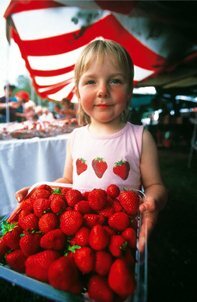 In season, have family fun by picking your own berries to take home. If the strawberries are divine (arguably the best in New Zealand - always vibrant in colour, sweet and firm), just wait to you taste the raspberries, Karaka Blackberries, red & black currants and gooseberries! Backpacker lodge: Butlers backpacker accommodation is open to all, including a TV lounge and library. Close to main road and cycleways. Campervans welcome. Reasonable rates, including a berry splendid Butlers breakfast. Open 7 days for berry inspired food and great coffee! Enjoy a quick visit, day trip, or stay awhile longer. LOVE berries - LOVE Butlers.